US President-elect Donald Trump has no warm feelings for the mainstream media and the feeling is reciprocal one. Therefore, when during his first press conference Trump openly accused CNN of lying no love has been lost there. There is a tradition of honeymoon between the newly elected US president and the media, which implies that the latter would abstain from any harsh criticism toward the leader of the United States within roughly the first 100 days in the office. Judging by how his first press conference went, Trump, apparently, should forget about any indulgence. His conflicts with the media has began already on the campaign trail. He famously had a row with a Fox News anchor Megyn Kelly in the first Republican presidential debate. The president-elect had initially scheduled the press conference for mid-December but postponed it. It finally took place on Wednesday with several reporters never getting an opportunity to ask a question. He turned down CNN reporter and described the broadcaster as "fake news." "I'm not gonna give you a question. You are fake news," Trump stated. On Tuesday, CNN and the BuzzFeed News website reported unsubstantiated memos, which allege that Trump has been groomed and supported by Russian intelligence for at least five years. BuzzFeed also became a target of Trump's criticism, was described by the president-elect as a "pile of garbage." "As far as BuzzFeed, which is a failing pile of garbage, writing it, I think they're going to suffer the consequences," Trump warned. 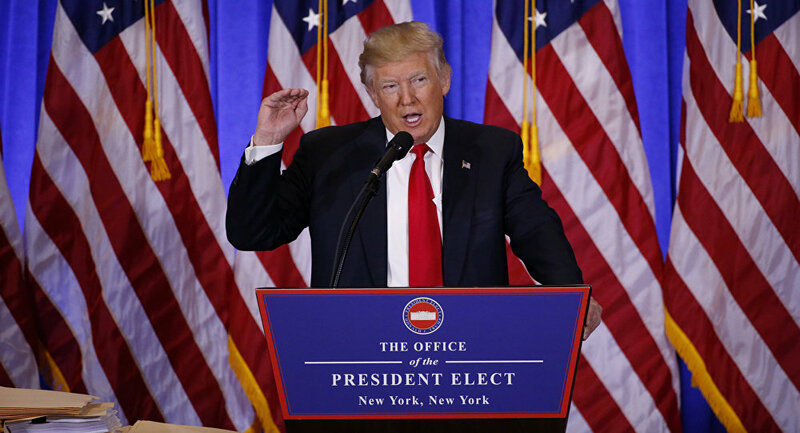 However, he called the press conference a success despite the presence of "fake news organizations." Both CNN and BuzzFeed replied to Trump's criticism. CNN stated that it was confident in the reporting and asked Trump's team to identify any inaccuracies in it. "CNN's decision to publish carefully sourced reporting about the operations of our government is vastly different than Buzzfeed's decision to publish unsubstantiated memos. The Trump team knows this," the broadcaster said in a statement. It added that "we are fully confident in our reporting" and stressed that the first amendment to the US constitution was the motivation behind the publication. CNN concluded the statement by asking Trump's team to be precise while criticizing the report. "We made it clear that we were not publishing any of the details of the 35-page document because we have not corroborated the report's allegations. Given that members of the Trump transition team have so vocally criticized our reporting, we encourage them to identify, specifically, what they believe to be inaccurate," the statement read. BuzzFeed took Trump's words ironically and turned "failing pile of garbage" into merchandise. One can now buy t-shirts, garbage can and several stickers referencing the phrase. "My cat's famous because of a failing pile of garbage," one of the stickers read. "I proudly get my news from a failing pile of garbage," one can see on the other. Russian Foreign Ministry spokeswoman Maria Zakharova said Thursday that allegations that Russia recruited US President-elect Donald Trump as published by CNN and BuzzFeed were "rubbish and nonsense."